The island flutes, the jungle drums, the hypnotic choir, the invoking of far off mystical lands...this is the world of exotica. Music that is raw and savage...well, as savage as a lounge orchestra can get. When a bachelor wants to escape from the cosmopolitan world he lives in and go a little more primitive, he finds his favorite exotica record for the hi-fi. He trades his smoking jacket for a grass skirt, his martini shaker for a flint spear. Mondo Exotica is a collection of the best of the best of exotica, which is basically the work of two composers: Les Baxter and Matrin Denny. In fact, out of the 18 tracks on this collection, there are six numbers by Denny and four from Baxter. Most of these tunes come with titles that help put you in that exotic locale: "Moon Mist," "Atlantis," "Jungle Madness," "Voodoo Dreams," and "Pyramid Of the Sun" just to name a few. 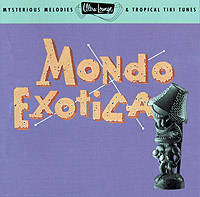 Mondo Exotica is part of Capitol Records Ultra-Lounge series, one of the best sources to get your martini music fix. Way back when the lounge revival started, record labels where scrambling around to find all these lost treasures, but all Capitol had to do, since it was the original home for most of these artists, was go dig in their own vaults.